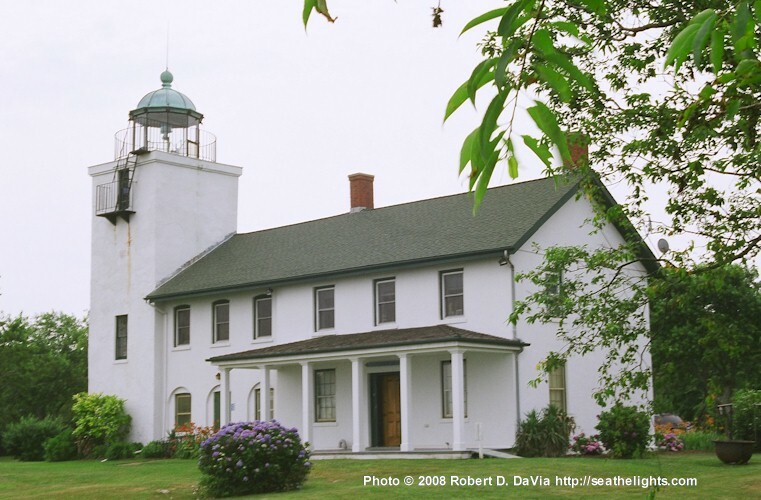 Horton Point Lighthouse was built and established in 1857. Its number on the U.S. Coast Guard Light List is 21,150. Its position is Latitude 41º 05/1' N, Longitude 72º 26.8' W. As a working light it gives a slow flashing green-tinged glow every ten seconds. The height of the tower above ground is 58 feet and the height of the focal plane is 103 feet above sea level; its range is approximately 14 nautical miles. 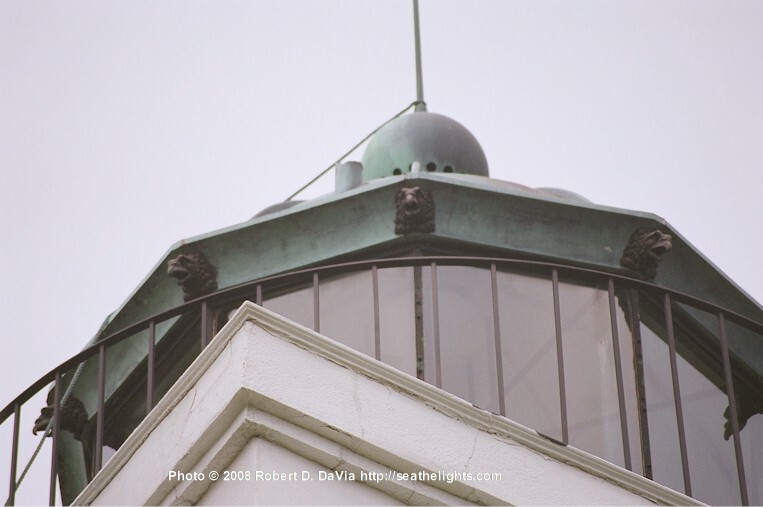 The light's original optic was a 3rd order Fresnel lens. Its present optic is a FA251. 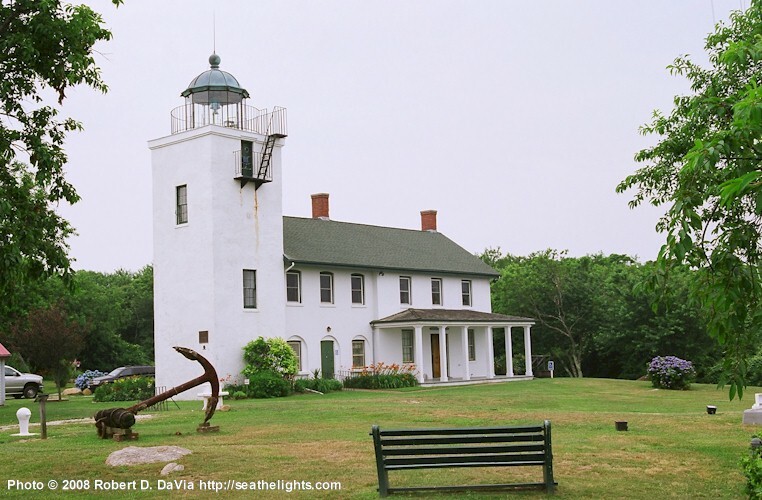 Horton Point is one of Southold's seven existing lighthouses. The tower and the joined Keeper's dwelling stand on the "Cliff Lot" of Barnabas Horton's original 1640 land grant. As originally built, the separated tower was joined to the two-story, Federal style keeper's dwelling by a cut-stone, arched windway. Some30 years later the archway was closed-in, and a second story was added between the structures, creating space for an assistant keeper's dormitory. About that time, the gracious north porch was added. In 1933, the light was turned off in the tower, and an automated one was lit on top of a skeletal tower 50' closer to the shoreline. 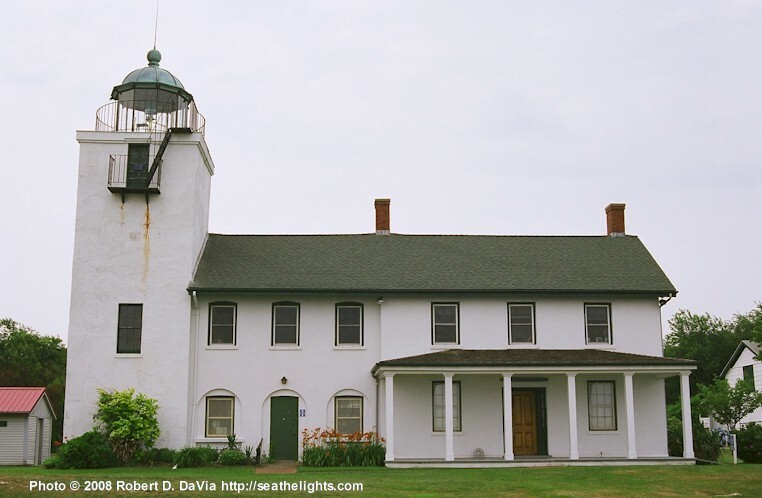 In January 1934, the Southold Park District purchased the lighthouse buildings and grounds from the U.S. Department of Commerce for one dollar. The last keeper stayed on in residence until the 1938 hurricane. During World War II, the buildings were occupied by the U.S. Coast Guard and successively other military units, as well as the Civilian Defense Corps. 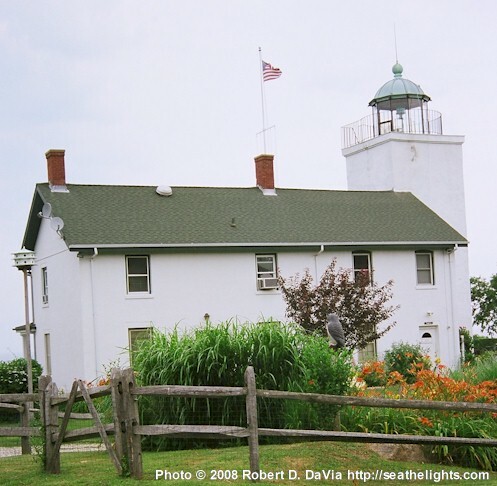 Oral history suggests that in 1757, George Washington saw and discussed the possibility of a lighthouse with Ezra L'Hommedieu, who later designated the placement of Montauk Lighthouse for then-President George Washington. Intense Restoration occurred in 1990, when the tower was repaired internally and externally, reopened and relit. The skeletal tower was then removed. 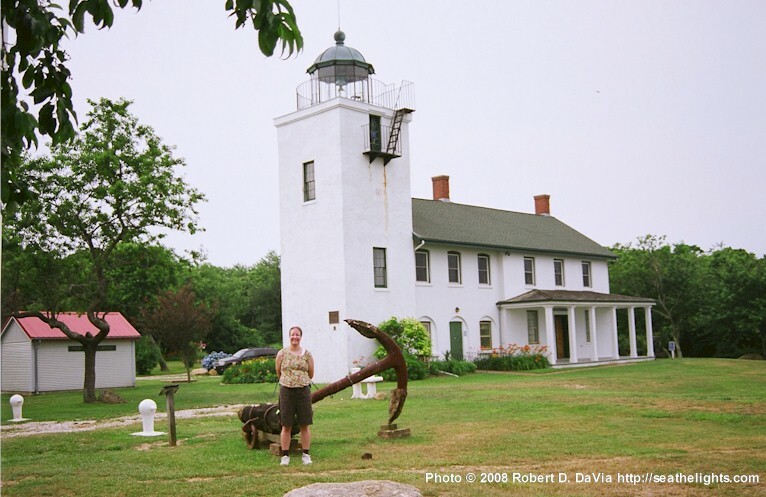 The Keeper's dwelling now houses Southold Historical Society's Nautical Museum, which displays early artifacts of the Township's Maritime Heritage. 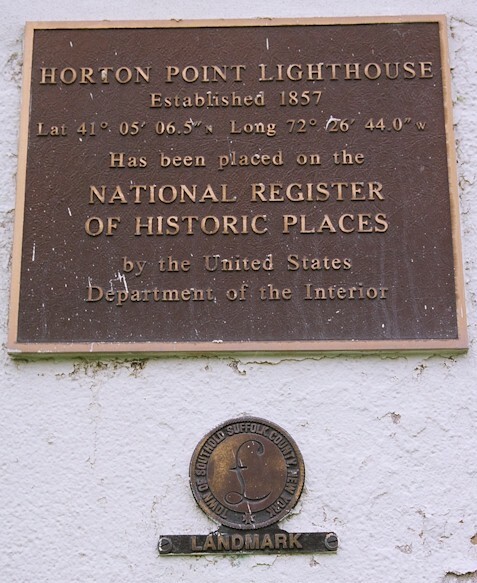 Horton Point Lighthouse is listed in the New York State Register of Historic Places and the U.S. National Register of Historic Places. It is a designated Town of Southold Landmark as well. The eight acre park is owned and maintained by the Southold Park District. It provides one of the most spectacular seascapes on Long Island's north shore. Here one can view the Sound and visualize its many moods, its past and present commerce and the challenges which faced L.I. refugees traveling to and from the Connecticut coast when Eastern Long Island was occupied by the British from 1777-1784. One can also conjure up visions of the Sloops of War in 1812 and WW II convoys of the 1940's. The park contains a natural bowl formation where musical events have been staged. Picnic benches are provided for visitors. West of the Keeper's swelling is a menhaden boiling pot from the burned down East Marion processing factory. 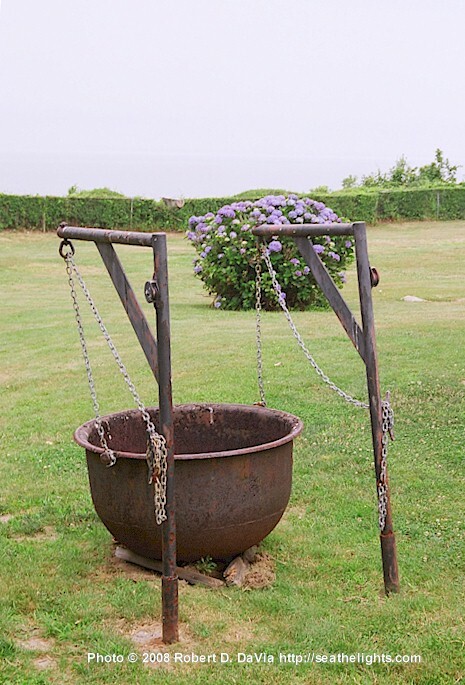 It was later salvaged by fisherman who used it to tar their nets on the beach. Nicole in front of the Commodore's anchor, and the bollards and bitt donated by the Cross Sound Ferry Company. Lying north of the tower in the same direction as it was found, rests the recovered anchor of the side-wheeler "Commodore" which was shipwrecked on December 25-26, 1866. The two cast iron bollards and bitt at the end of the clamshell drive were donated in 1990 by the Cross Sound Ferry Company. 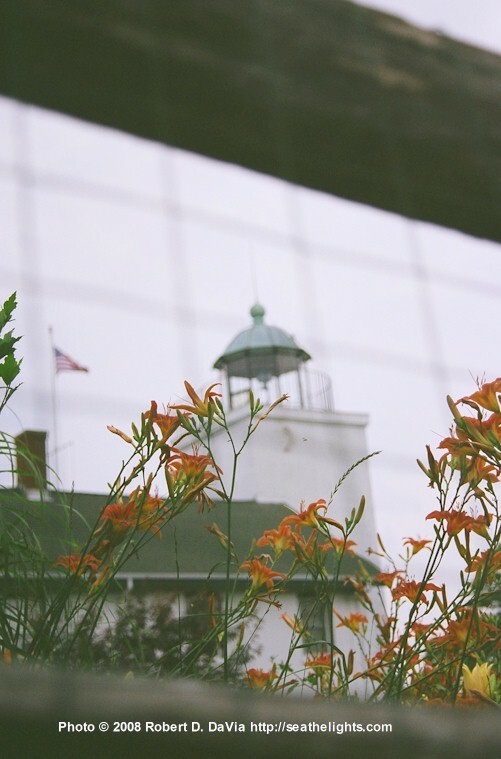 The eighty foot flag pole (not pictured) was a gift from the United States Coast Guard on June 7, 1990 when the light was returned to the restored tower. It is mounted on the foundation of the 1933 skeletal tower which was demolished. Below our National Colors on its yardarms, fly code flags spelling out the initials of the Southold Historical Society and those of the Southold Park District, symbolic of their close relationship and cooperation which makes Horton Point Lighthouse and its park grounds a "gem" of the North Fork. The Nautical Museum displays an unique collection of both museum-owned and patron-loaned lighthouse and other early maritime artifacts. Sea chests, paintings, photographs, maps, scrimshaw, baymen's tools, and various marine displays create for the visitor a vision of life, culture, and craftsmanship of the farmer-mariners of Southold Town. While some earned their livelihood from the bounty of the Sound, bays, and creeks, others sailed the oceans of the world in search of whales or profitable cargos and to protect our national interests. The basemen's "Admiral Baumann Room" while housing ship artifacts affords limited space for nautical programs and video tape viewings. Text reprinted from the Horton Point Lighthouse and Nautical Museum pamphlet.